Some aspects of the instructions are not clear. High quality decals, and a nice way to finish your Mistel. The Ju 88 and its derivatives are clearly a passion for John McIllmurray of AIMS Decals from Bexleyheath, Kent UK. With this new release, AIMS Decals expands upon this core interest and adds to an already impressive range of decals and conversion/update sets for the Ju 88/188 series. Markings for a single example are supplied, Ju 88 A-4 CN+FK with Bf 109 F-4 NA+YS 2./KG 101 mounted above. St. Dizier, France, June1944. The decals themselves are arranged on a single blue coloured backing sheet. The carrier film is thin, although it extends somewhat beyond the colour boundaries on some of the decals, and depending on the modellers preferences they may wish to trim away some of the excess. The resolution, colour register and density are perfect. 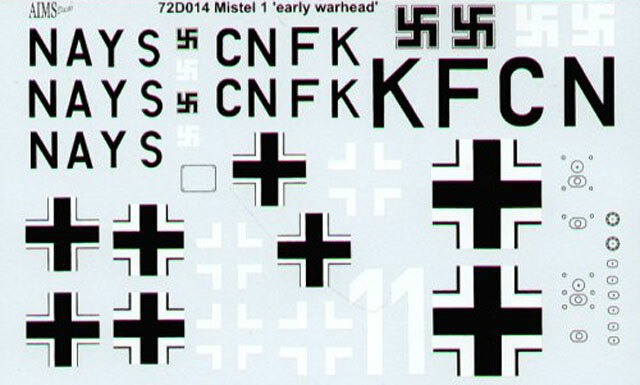 The modeller is provided with a full set of Balkenkreuz, fuselage/wing codes and swastikas (the later is in provided in two colour parts, the black edge and centres being placed over a white base). There are even decals for various hatches, antenna mounts and fuel cell caps. A full colour decal placement sheet is included and this is quite comprehensive. Where doubts exist; for instance the use of colour bands and factory codes under the wings, the modeller is informed and is given the choice of options. There are, however one or two points that confuse me some what; The profile shows the assembled Mistel 1 with the Bf 109 F in place and the early warhead fitted. The plan view only shows the Ju-88 and this with the standard cabin fitted. Since the commentary mentions that this Mistel 1 was delivered to St Dizier with personnel flying in the Ju 88, I therefore assume that the modeller has the option of producing this subject as delivered (with the Ju 88 cabin) or after the Mistel warhead has been fitted. 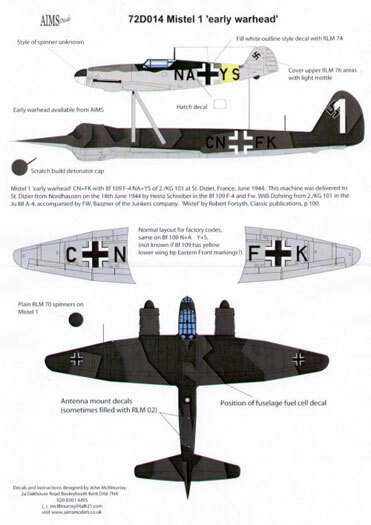 Furthermore, only the plan view camouflage scheme for the Ju 88 (RLM 70/71/65) is provided. I have to assume that the 109 is in the mid-war 74/75/76 scheme, but again, this is not clearly spelt out. Italeri has produced a 1/72 Mistel 1 kit by combining their Ju 88 A-4 and Bf 109 F kits. Their Ju-88 is not bad, but their Bf 109 F would best be avoided. A more up to date model of the Mistel 1 could be made by combining the recently released Hasegawa Ju 88 series with the FineMolds Bf 109 F series. These decals would enable modellers to finish the job.